A 1,240 acre forested Preserve near Camp Sherman, Oregon. Open during daylight hours, year round. 10+ miles of hiking and biking trails. Pine, larch, fir forest and several miles of Lake Creek. White-headed woodpeckers, fall colors of maple and larch. ***PLEASE NOTE*** The Metolius Preserve is currently experiencing muddy trail conditions. If you encounter muddy trails, please turn around and return to the trailhead. Thank you for keeping our Preserves in great shape! The Land Trust acquired and protected the 1,240 acre Metolius Preserve in 2003. This primarily forested property located near Camp Sherman, OR (see map below) supports mature ponderosa pine, Douglas fir, and western larch, as well as a rich diversity of other plant species. Three miles of Lake Creek, an important tributary to the Metolius River, flow through the property, contributing to the rich habitat found on the Preserve. Watch for wildlife: Numerous birds inhabit the Preserve (more than 80 species have been identified) including the white-headed woodpecker, a sensitive species. Large mammals such as elk, deer, black bears, cougars, bobcats, badgers, beavers, and otters also make their home here as do smaller mammals such as the northern flying squirrel, voles, and shrews. See the Preserve's Bird List or help with bird surveys. Discover the story of native fish: Lake Creek, which runs through the Preserve, provides habitat for native redband trout, spring Chinook salmon and serves as a migratory route to Suttle Lake for sockeye salmon. Explore native plants: The Metolius Preserve protects a diverse array of plants including the rare Peck’s penstemon. Join a Land Trust plant tour to learn the names of the various native plants that flourish on the Preserve such as snowberry, ocean spray, nutka rose, incense cedar, and the seasonally colorful western larch and vine maple. The Metolius Preserve protects important fish and wildlife habitat while protecting and promoting old-growth ponderosa pine forest conditions. Lake Creek currently provides spawning habitat for native redband trout and nesting habitat for a wide range of neotropical songbirds. Lake Creek is also an important part of current efforts to reintroduce spring chinook and sockeye salmon to the upper Deschutes Basin. Historically, a significant proportion of Metolius River spring chinook spawned in Lake Creek, and one of Oregon’s two native sockeye salmon runs migrated through Lake Creek to Suttle Lake. By protecting the Metolius Preserve, the Land Trust is helping to ensure a successful reintroduction of salmon in the upper Deschutes Basin. 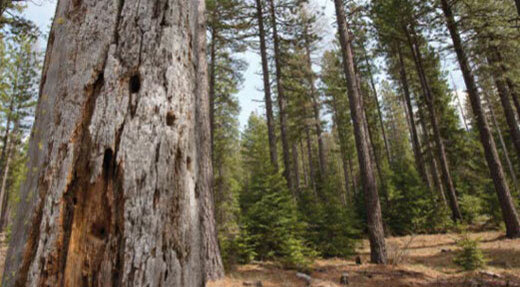 Forest Restoration: The Land Trust's forestry efforts have been focused on promoting old-growth ponderosa pine forest conditions which provide important habitat for white-headed woodpeckers and other wildlife. Restoration activities include forest thinning, decommissiong old logging roads, and re-vegetation of closed areas. Learn more. Stream restoration: In 2008, the Land Trust worked with the Upper Deschutes Watershed Council to remove a large culvert on Lake Creek to improve fish passage and habitat. Managing weeds: Noxious weeds are a reality at all Land Trust protected lands. If they are not actively managed they compromise healthy native plant communities. The Metolius Preserve can be accessed via two main trailheads: the North Trailhead and the South Trailhead. Both entrances to the Preserve are open to the public during daylight hours year-round. Pedestrian, mountain bike, and horse travel allowed where designated. Dogs must be kept on leash. Please clean up after your pet. Follow state laws when fishing and hunting on the Preserve. No motorized vehicles, camping, campfires, or smoking. Please note: the Metolius Preserve is private property owned by Deschutes Land Trust. Your use of the property is conditional upon these and any other posted rules. Preserve users failing to observe posted rules are trespassing and subject to applicable laws and penalties. Visitors to the Preserve may encounter risks associated with terrain, wildlife, and weather. Please exercise appropriate caution: the Deschutes Land Trust is not liable for injuries to Preserve visitors. The Metolius Preserve is located west of Camp Sherman, Oregon. The Metolius Preserve has two main trailheads: The South Trailhead and the North Trailhead. Detailed driving directions, including downloadable PDFs, can be found below. Trail maps: View the trail map for the Metolius Preserve or the Lake Creek Trail map or download a georeferenced map for use in mapping apps. The map below shows the location of the Metolius Preserve along with other Land Trust conserved lands.